This revised and updated edition presents detailed analysis of the history and current state of the G20, and the challenges it faces. The emergence of the G20 was the result of calls for full inclusion of major developing and other systemically important countries and to reflect new global economic and political realities. The growth of Chinese power, growing significance of other major developing… countries and new concerns concerning anti-globalization and rising protectionism in the West have all resulted in important changes to the dynamics of the institution. The suspension of Russia's membership in the G8 has also necessitated a change in G7/G20 dynamics and the G20's processes, agenda priorities and role in global governance. 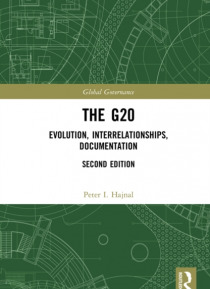 Providing a historical overview and analysis of the evolving agenda, methods of performance evaluation, relationship with structured international organizations and other external actors, Hajnal's text is an authoritative work of history, analysis and reference on the G20 and also G7/G8/G20 reform. This book is an essential source for researchers and students focusing on the G20, international organizations and global governance, and more generally for scholars in the fields of political science, economics, and finance.